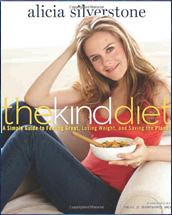 The Kind Diet: A simple guide to feeling great, losing weight and saving the planet was written by actress Alicia Silverstone. Silverstone has been eating a vegan diet for over ten years and believes that it is kinder to our bodies and the planet to eat this way. The book explores the connection between our dietary choices and the ecological impact on the earth. Silverstone highlights the negative effects of a diet based on animal products and processed foods and explains why they are unhealthy. She says that when you follow The Kind Diet you will not only lose weight, but also feel great and significantly improve your health, while protecting the ecological balance of the planet. Silverstone proposes that meat, fish, milk, and cheese are not the healthy foundation of good nutrition that we have been led to believe. She explains how these foods are actually the cause of the dramatic increases in the rates of disease and also how their production is having a profoundly negative impact on the ecology of the planet. She addresses common concerns regarding the nutritional adequacy of a vegan diet and outlines how to ensure you are getting enough of the important nutrients such as protein, iron and calcium. Silverstone also recognizes that dietary change is more likely to be sustainable when a gradual approach is adopted. As such The Kind Diet has three levels that will allow you to start eating a vegan diet at a pace that suits you. Dieters commence by reducing their intake of meat and start to experiment with a greater intake of plant-based foods. Next a full vegan diet is adopted, however, in this phase dieters are allowed to include vegan convenience foods such as tofu hot dogs and nondairy ice cream. The final level is based on the principles of macrobiotics and eliminates all processed foods in favor of whole grains and vegetables while emphasizing seasonal eating. The Kind Diet is a big advocate of dessert and encourages dieters to include healthy desserts in the diet three to four times a week. It does however recommend that desserts are eaten less often if you would like to lose weight. Fruit, vegetables, oatmeal, rice, pasta, nuts, seeds, tofu, tempeh, beans, legumes, avocado, miso, umeboshi plum, sea vegetables, vegan bacon and hotdogs, nondairy ice cream, brown rice syrup, maple syrup, green tea. Silverstone says that even exercise is kind on The Kind Diet. She advises dieters to listen to their bodies and to stop thinking of exercise as a punishment you must go through in order to lose weight. Walking and yoga are especially recommended. The Kind Diet: A Simple Guide to Feeling Great, Losing Weight, and Saving the Planet retails at $29.99. Provides advice on how to eat a nutritionally balanced vegan diet. Offers a method of transitioning gradually to a vegan diet. Increases awareness of how our food choices may affect the environment. Encourages the intake of healthy desserts. Includes a meal plan and 75 recipes. May be difficult to follow especially for dieters who prefer not to stop eating meat. Recipes include a lot of ingredients that are difficult to find and expensive. Many nutrition experts dispute that a vegan diet is healthier than a diet that includes some animal products. The Kind Diet offers readers a thorough introduction to the theory and practical applications of a vegan diet. Silverstone answers common questions about the diet as well as providing dieters with a sensible plan that will allow for a gradual transition to a vegan diet. Silverstone, A. (2011). The kind diet: A simple guide to feeling great, losing weight, and saving the planet. Rodale. Not into all the “save the animals” thing but this book offers good information to become more food conscience. In the documentary “The Future of Food” we are consuming more and more “genetically engineered” food and no one knows what the future health risks will be. I for one want to consume more natural food products so my body and mind will help me age well and live life to the fullest!